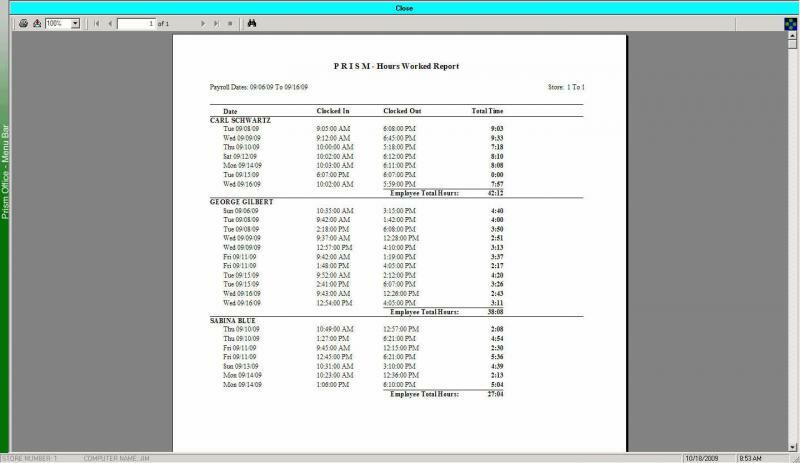 Below you will find screen shots of the Prism 'Point of Sales' and Prism Office programs in action along with a short description of each feature. 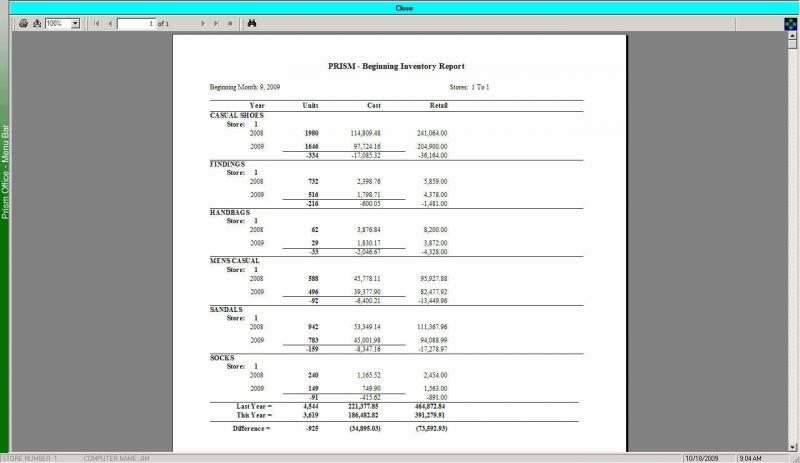 While looking through the screen shots, keep in mind that you can click the bottom right of each screen shot to enlarge its view or click the report titles, at the bottom of each report, to have them fully open up in (PDF) format. 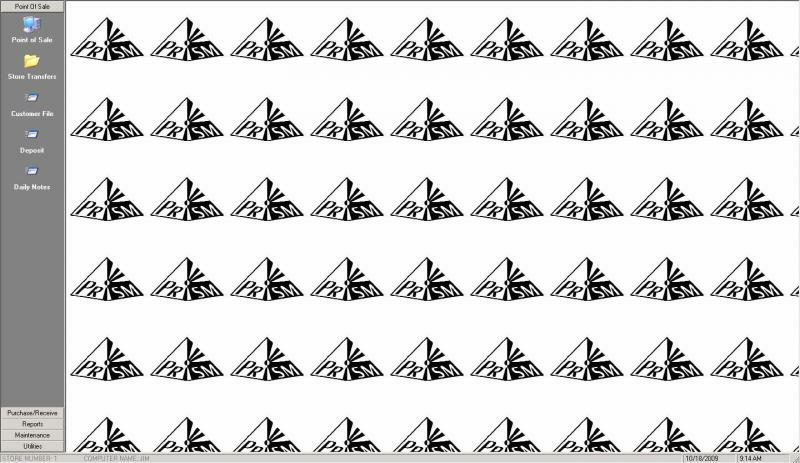 The Prism 'Point of Sale' system is by far the fastest and easiest to use in our industry. For those of you that are mouse savvy great but for others this screen can be operated by using the keyboard only. As you can see on the above sales screen, a sale transaction is in progress. #1 - The customer's phone number has been use so that a complete sale/return record will be saved for this customer. This feature may be turned Off for each sale by simply not entering a customer phone number. #2 - An employee number has been used so that this sale will be awarded and tracked to this employee. If needed, multiple employee numbers can be used for each item to properly award each employee for their part of this sale. #3 - There are 2 items being sold to this customer. 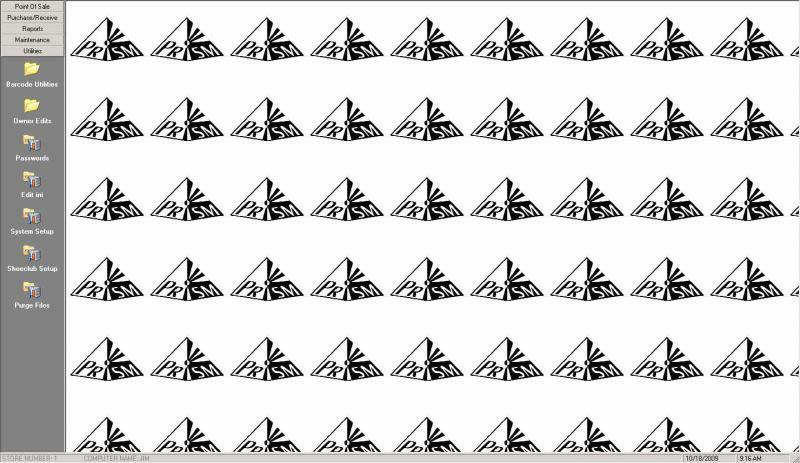 Each line contains the sale type, quantity, stock number, description, size, retail, tax rate, total amount and employee number. 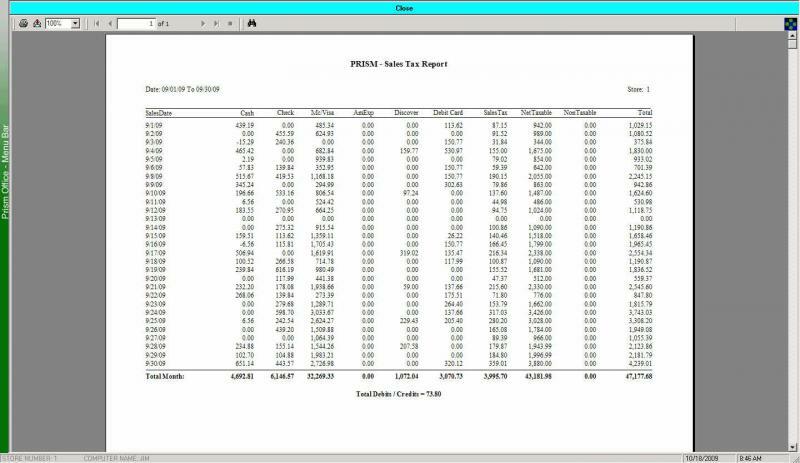 #4 - As each item is entered, the Sub Total, Tax and Total Due are presented at the bottom right of the sales screen. 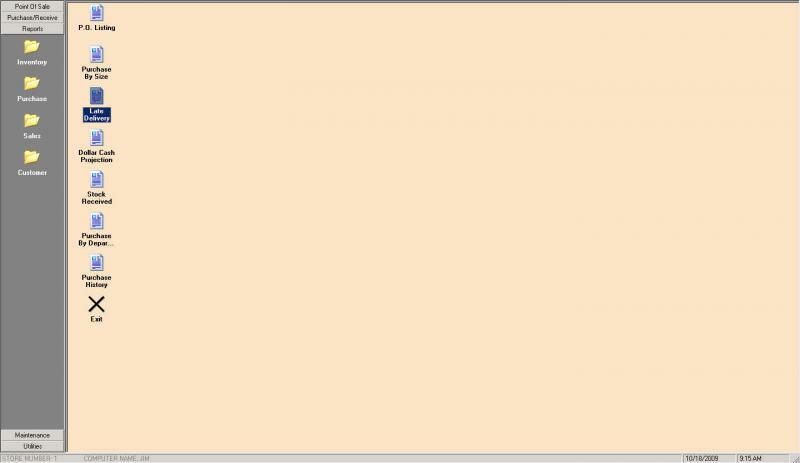 Once the sale is completed, you move to the tender screen by simply pressing the F1 key. 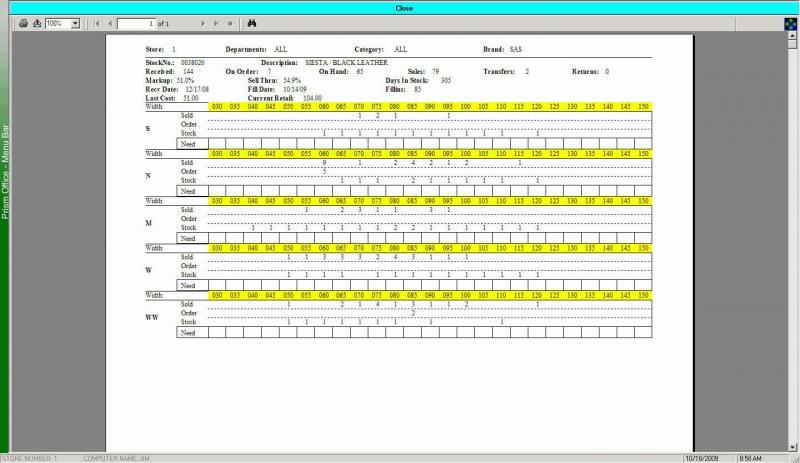 On the tender screen, you may select from 9 different tender type or a combination of all. 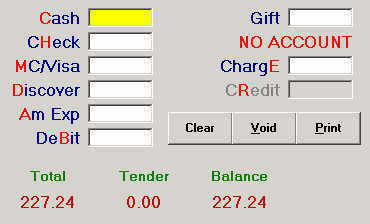 To prevent entry errors, the user may simply press one of the letters highlighted in Red and the current balance amount will automatically be placed in that tender type. 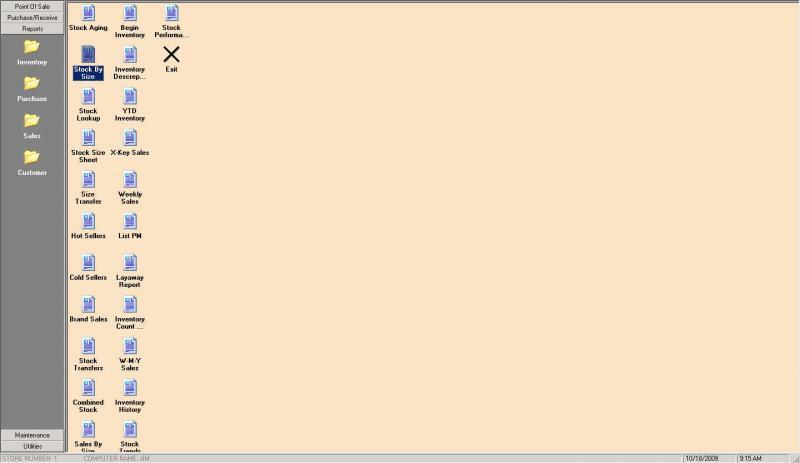 Once the full balance has been paid, the user simply presses 'P' to print the sale receipt or clicks Print with the mouse. Special Orders are perform from the Point of Sales screen by pressing the F4 key. The Special Order function is used to order items that are currently out of stock or to order items that are not carried in the store for your customers. 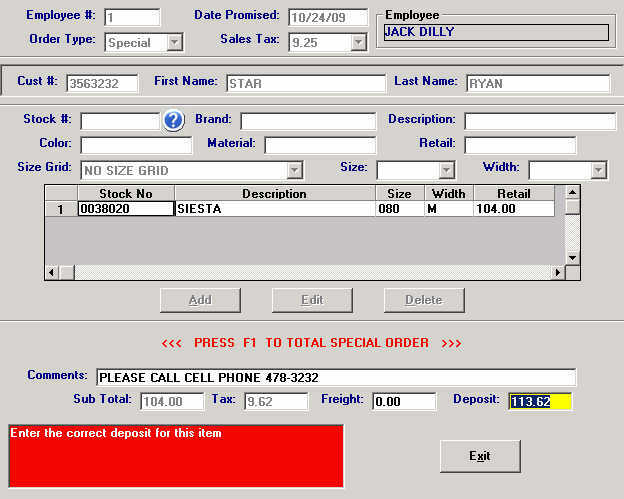 As you can clearly see on the above screen, employee #1 is placing a special order, to be delivered on 10/24/09 for Star Ryan. The item is a 0038020, Siesta, in size 080 M, at a retail of $104.00 and a sales tax of $9.62. In the comments field, the customer has requested to be called on her cell phone and will be paying the full deposit amount of $113.62. 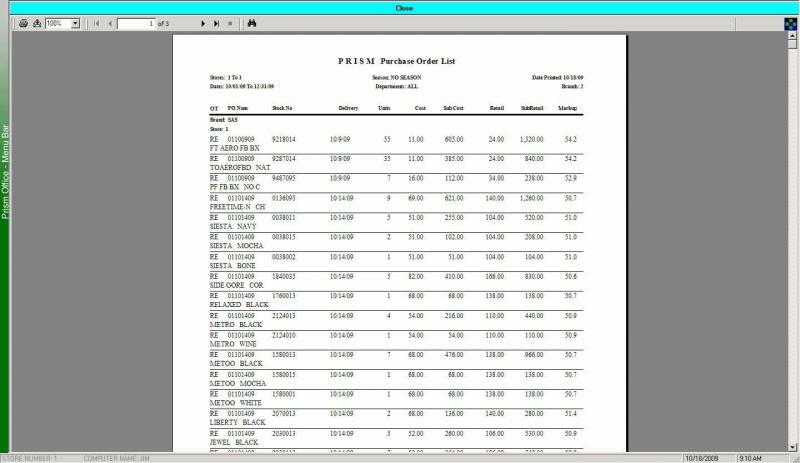 At a later time, another function in Prism will automatically write a purchase order for this item. Later when the purchase order is received into inventory a document will be printed showing you the customer to be called to pickup the special order. When the customer arrives to pickup their special order, the Point of Sale screen will know if additional money is due and will record the sale to the customer history, take the item out of inventory, write a transaction to the sales and cash files and remove the special order. During this entire process, the special order is tracked and monitored by the system so that you will always know its status. Layaway's are performed from the Point of Sales screen by pressing the F7 key. 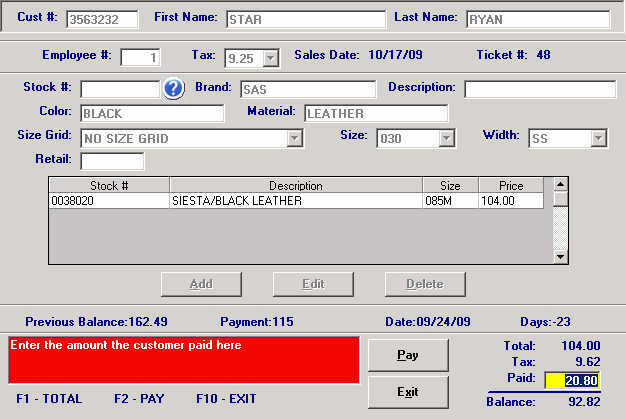 The Layaway function is used to place stock items into layaway for a customer. 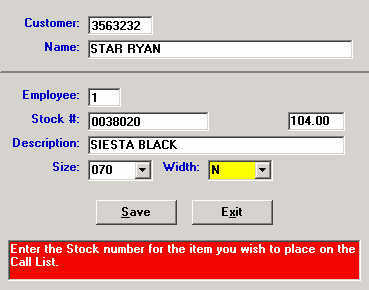 As you can see on the above screen, a layaway is being entered for Star Ryan, by employee #1 and is taxable. 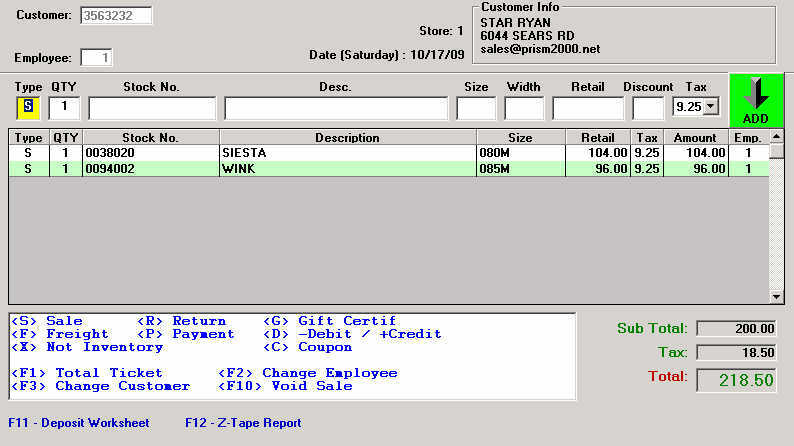 The item being placed in layaway is 0038020, Siesta, in size 085 M for a retail of $104.00 and a sales tax of $9.62. 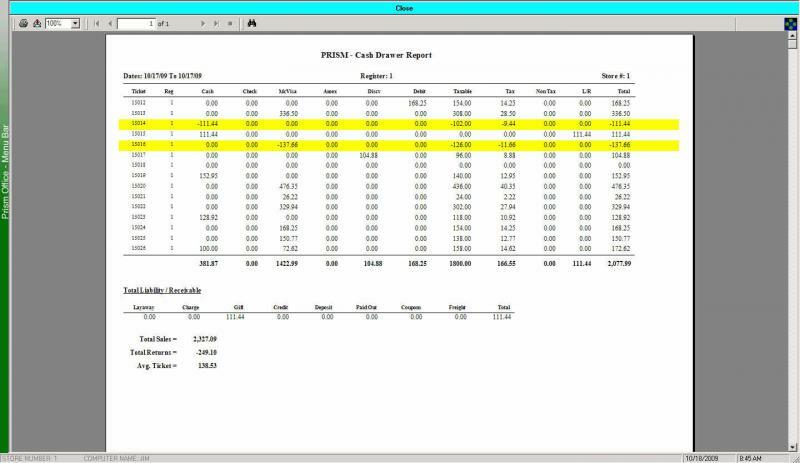 The paid field is automatically calculated by a percentage that you setup in Prism, however any amount up to the full amount may be used. Once the layaway receipt has been printed, the entire transaction is monitored by the system until the layaway is fully paid for and picked up by the customer. All layaway's and payments are done from the Point of Sales screen and are tracked by additional reports in the Office system. 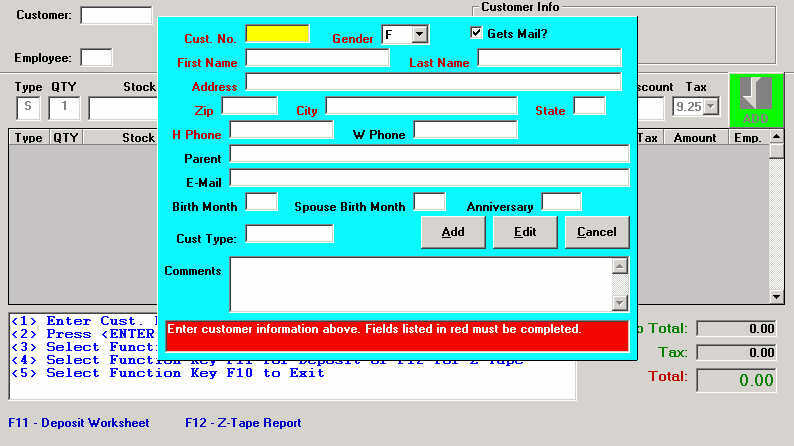 You may easily access the Customer file by pressing the F2 key from the Point of Sales screen. 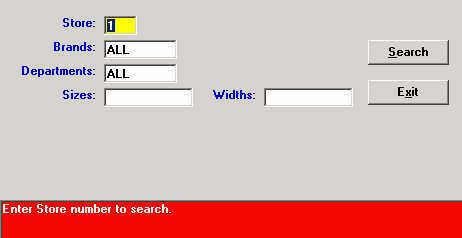 From this screen you can Add or Edit a customer's profile. Each employee can access the employee time clock by pressing the F5 key on the Point of Sales screen. 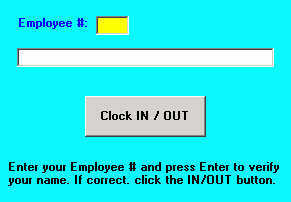 The above screen appears where the employee simply enters their employee number, verify their name and clicks the Clock IN/OUT button. As you can see, the employee is unable to select the date and time and therefore cannot fudge on their hours worked. Other functions in Prism Office can be used by owners and managers to adjust clock In or OUT times, to report on hours worked by date range , employee sales by hour and payroll. 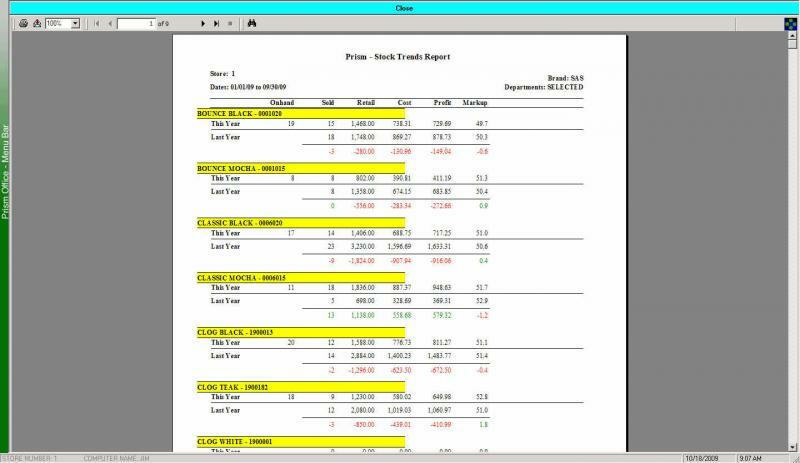 You may access the Stock Look Up screen from Point of Sales by pressing the F6 key. 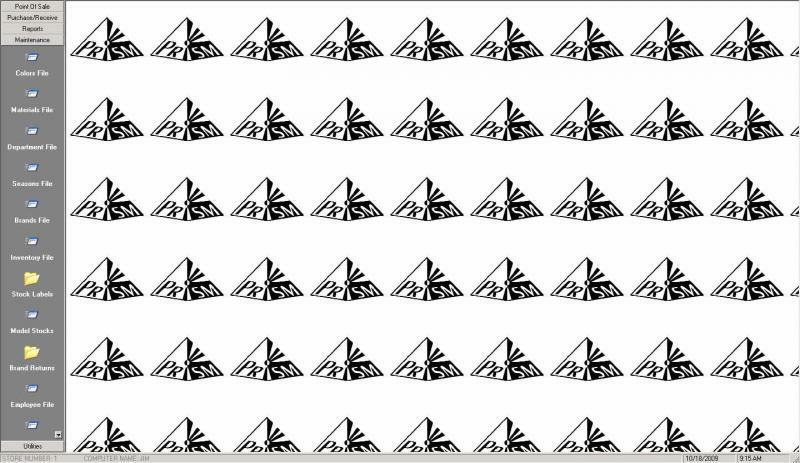 Once the store number and stock number are entered the following screen appears showing a mini history of the item plus sizes on-hand, sizes sold and sizes on-order. 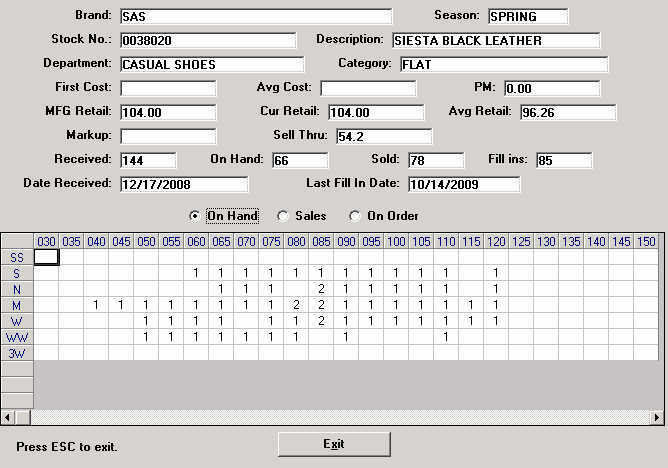 Notice, that on the Point of Sales screen, no cost figures appear. If you have multiple stores, this screen can be used to find a size in another store that is not currently in-stock in your store. You may access the Search screen by pressing the F7 key from the Point of Sales screen. This function allows you to perform two powerful and different searches. #1 - Size Search allows you to search for items in your store from one or multiple Brands, one or multiple Departments and in one or multiple sizes. #2 - Store Search allows you to perform the same search as above but searches all the stores using the Prism system. You may access the Call List by pressing the F9 key from the Point of Sales screen. Let's say that a customer needs an item that you do not currently have in stock but the item is on order and will arrive soon. Once the above data is entered and saved, when the item is received into stock a notice will be printed that reminds you to call the customer and let them know the item is now available for sale. 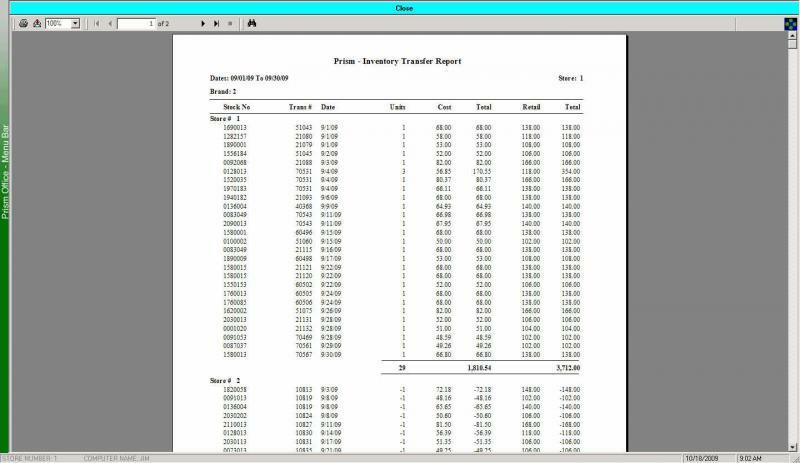 You may access the Deposit Worksheet by pressing the F11 key from the Point of Sales screen. This screen is filled out at the end of each day by counting the change, paper money, credit cards and checks and entering them into the screen. 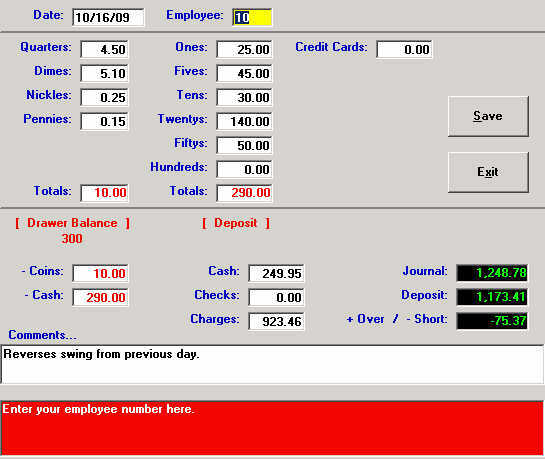 Once all has been entered, Prism calculates your cash drawer as either Even, Over or Short. Once saved, this information can be transmitted to the main store or office to be checked against the stores bank deposit slip. 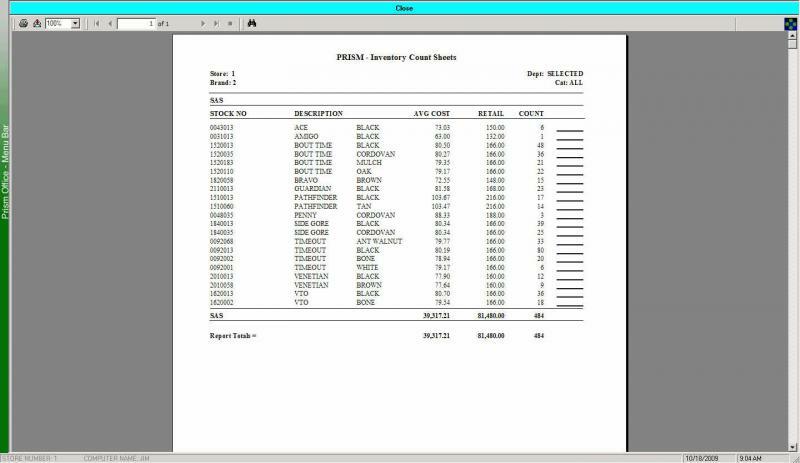 At anytime, pressing F12 prints a Z-Tape report showing what today's numbers are in cash, checks, credit cards, net-taxable, non-taxable and sales taxes. At the end of each day this can also be used to balance the drawer and make the deposit. The Prism 'Point of Sales' system is very powerful, easy to learn and extremely quick. Our new clients tell us, all the time, that in the time it takes to ring a sale on an old fashion cash register, you can ring a sale using Prism. 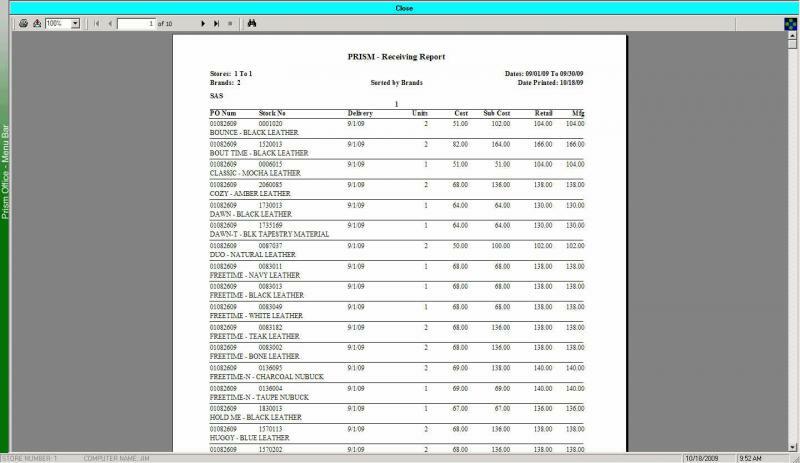 The difference is that Prism records many pieces of information that can be later use to effectively manage your store. When you access the Customer Query screen, you may use multiple questions to produce a particular output. When the Create List button is clicked, 2 list of customer information is created. One list contains the names, addresses, cities, states, zip codes, sizes, date of last purchase and total purchases and the other list contains the names and email address for each customer found. Once the list are created, you may choose to print address labels, print the list or export to a file that may then be imported into an email program or other software. The Maintenance menu is used by owner / manager to add, edit and delete items from the Colors file, Materials file, Departments file, Seasons file, Brands file, Inventory file, Model Stocks file, Employee's file and Case Packs file. 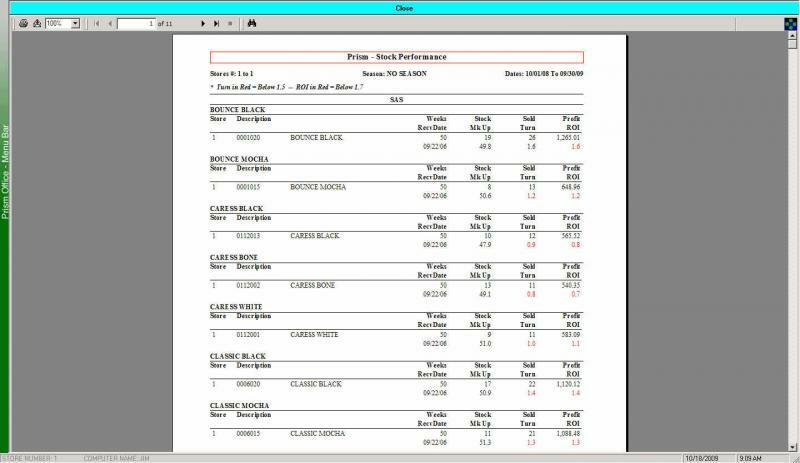 Other functions on the menu are Create/Print Stock Labels, Edit Employee Time Clock, Brand Returns/Charge Backs, Retail/Cost Price Changes, Dated Markdowns and to setup the 3 receipt messages/policies for Sales, Specials and Layaways. By selecting the inventory file you can easily Add, Edit and Delete items from inventory. 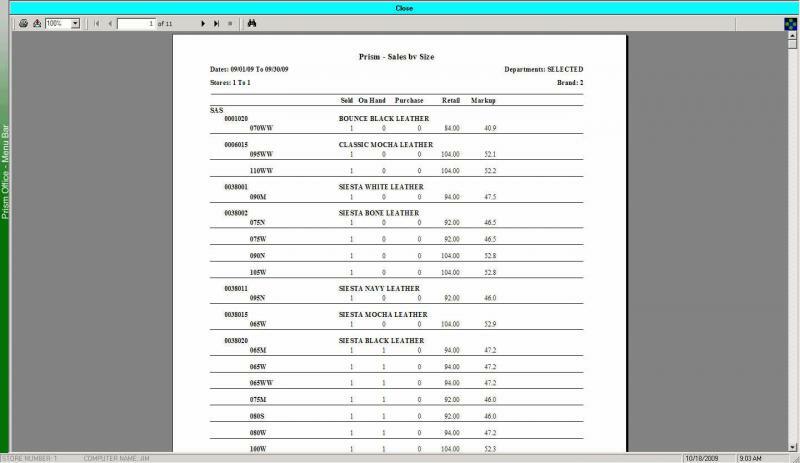 As you can see above, this file stores each item by Description, Stock #, MFG Stock #, Brand, Season, Department, Category, Color, Material, Cost, Your Retail, Manufactures Retail, PM, Size Grid plus all Sizes On-Hand and Sizes Sold. On the Utilities Menu you will find the following items. They are intentionally placed on this menu and are normally protected by the Owner password. The Barcode Utilities menu is use to read in manufacture barcodes, to add/edit/delete existing barcodes, perform physical inventories using barcodes and to report on inventory items that are not properly barcoded. The Owner Edits menu allows you the owner special access to the Cash Drawer file, Sales file, Customer History file, Receiving file, Transfer file, Inventory file and Zip Code file. The Passwords Menu is where you setup the Owner, Manager and Assistant passwords for the entire system. 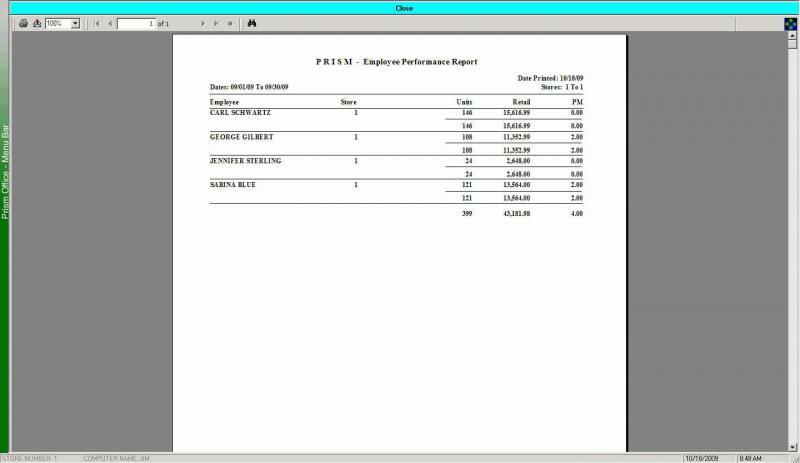 Each Prism Office and Prism Point of Sales menus choices can be assigned either a Owner, Manager, Assistant or NO password choice. Using this powerful tool you can lock the system down as you see fit. The System Setup screen is where you setup information about your store name, address, locale, phone number, fax number, printers, drawer balance layaway deposit percentage and up to 3 sales tax amounts. The Shoe Club Setup screen is used to activate the shoe club reward program built into Point of Sales. 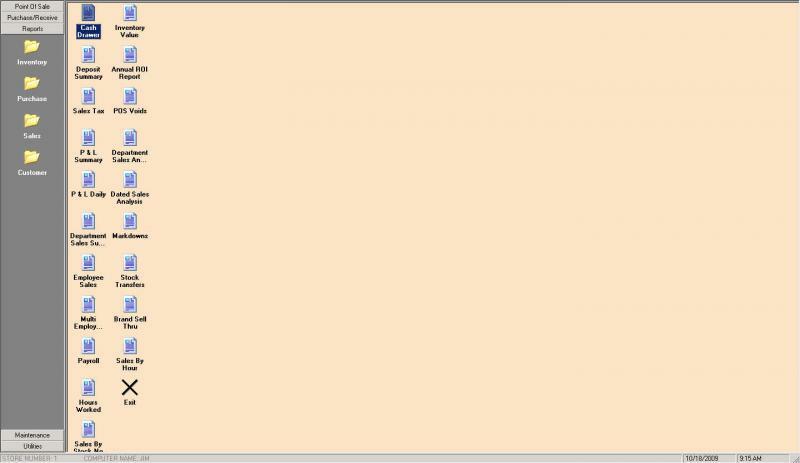 On this screen you setup the award units, award percentage and the selected departments that will be used in the shoe club awards program. The Purge Files screen is used annually to quickly remove old data from the Prism file system. 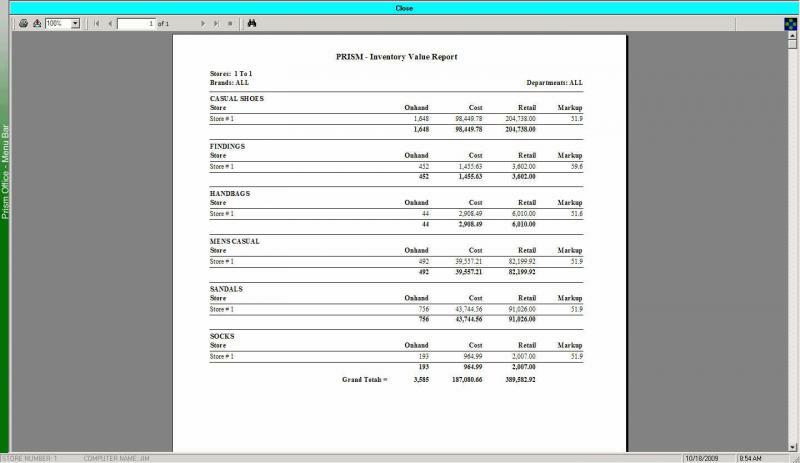 Each of the data files in Prism may be purged of data based on start date and use. 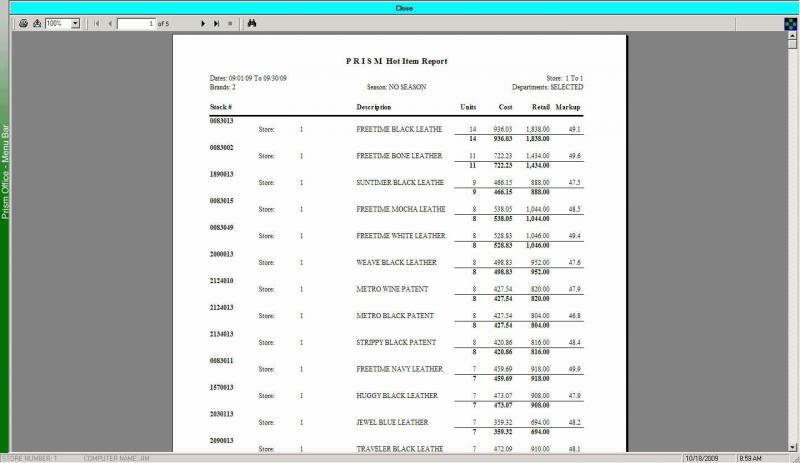 What follows are several screen shot of a few of the many inventory reports Prism has to offer. Each report has it's name listed below the report. Since inventory reports may be run at anytime daily, weekly, monthly or yearly, you have many powerful tools that allow you to quickly manage your largest asset Inventory. Using these tools will allow you to increase your Stock Turn and Return On Inventory Investment. It is our opinion and the opinion of most authorities that these 2 things alone make a profitable operation. 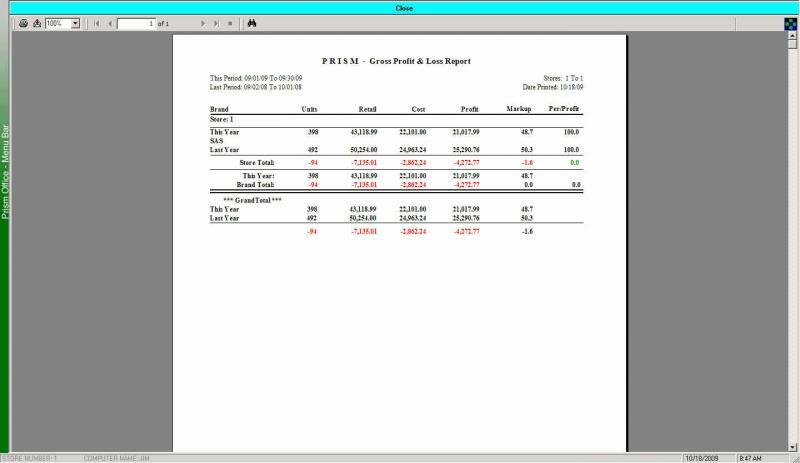 What follows are several screen shot of a few of the many purchasing reports Prism has to offer. Each report has it's name listed below the report. 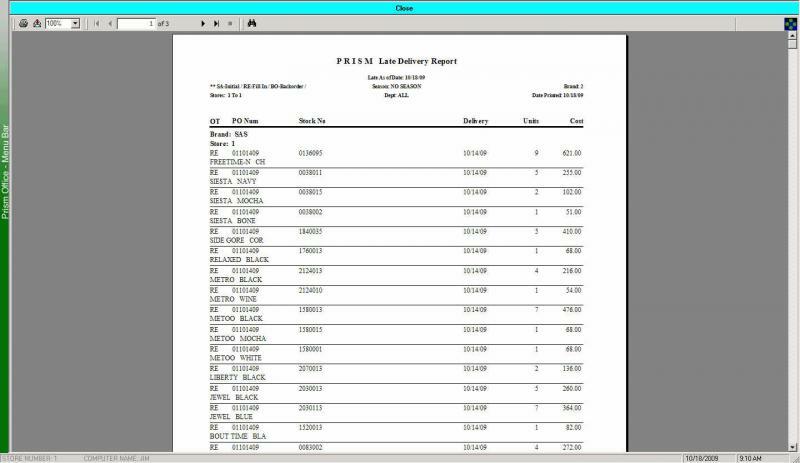 The variety of purchase order reports that Prism has to offer will enable you to keep track of units and dollars o-order, items that are late in delivery and a complete purchasing history by Brand and Department. 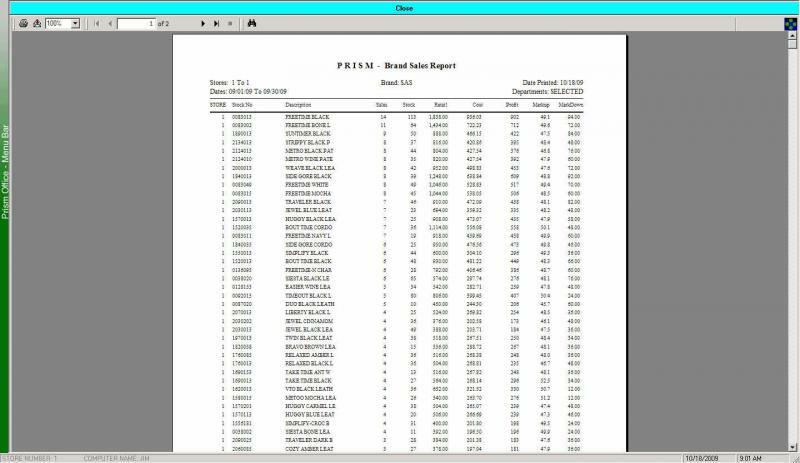 What follows are several screen shot of a few of the many sales reports Prism has to offer. Each report has it's name listed below the report. 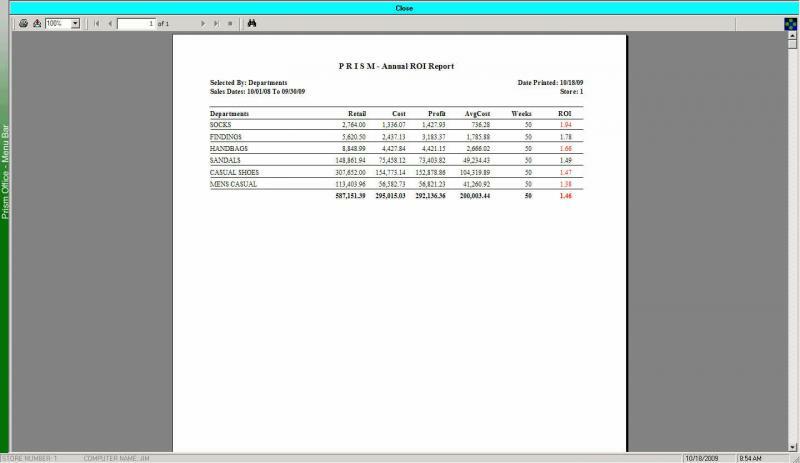 The variety of sales reports that Prism has to offer will enable you to keep track of the dollars and cents part of your business. Whether it's accounting for dollars taken in by Point of Sales, dollars relating to profits or dollar return on inventory investment.